What is deep brain stimulation? How does it work? Listen as Editor-in-Chief Bill Yates (University of Pittsburgh) and neurosurgeon Dr. Mark Richardson (University of Pittsburgh) discuss this therapeutic technique that has been effective in treating Parkinson’s disease, essential tremor, dystonia, chronic pain, and other diseases. 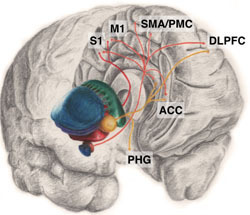 Dr. Richardson also provides some valuable insight into our collection of articles on research related to the neurobiology of deep brain stimulation.